Quite a day out in the "Deep East" for Earth Day. Claire was prompt as always and Chris and I got to Brookfield Elementary a bit late, though so did the trees, the planting of which was the mornings work as organized by Amber Blackwell of Higher Ground Neighbrohood Development. So the kids and volunteers were prepping soil pits and gathering tools. R.B. from the Scraper Bike Team was there with his mobile sound system trike and Claire had posted up the game boards developed by Janette Kim and the California College of the Arts students in her seminar that showed the impacts of sea level rise and groundwater flooding on the communities around the San Leandro Bay. A few kids came by and we helped them find their houses on the map. Then Miss Narajano brought over her class of 20 or so 8 and 9 year olds. They quickly mobbed the map, trying to find their houses. Miss Narajano got them under order and we explained sea level rise, flooding and groundwater. It's nice to have a 3 foot tall kid and a 6 foot tall gringo to use as props to explain how high the sea is going to rise! We asked if any of the kids had basements and if they filled with water. One did, a little girl named Marika who lives near the school along 880 at the tip of Columbia Gardens. Marika added: "like the one Donald Trump's wants! Right around my house!.” Laughs from the kids, groans from the adults. "But what about your neighbors?" "Oh, well I guess around all of them too"
"But what about the water that comes up in your basement?" "We'll build a wall on the floor to keep it out"
"And what about when it rains? You've built a bathtub around your house and your neighborhood. It will just fill up with water!" Which led us into a brief and probably confusing discussion of pumps and groundwater and all kinds of other possibilities for dealing with sea level. Anyway, the kids had a lot of questions. 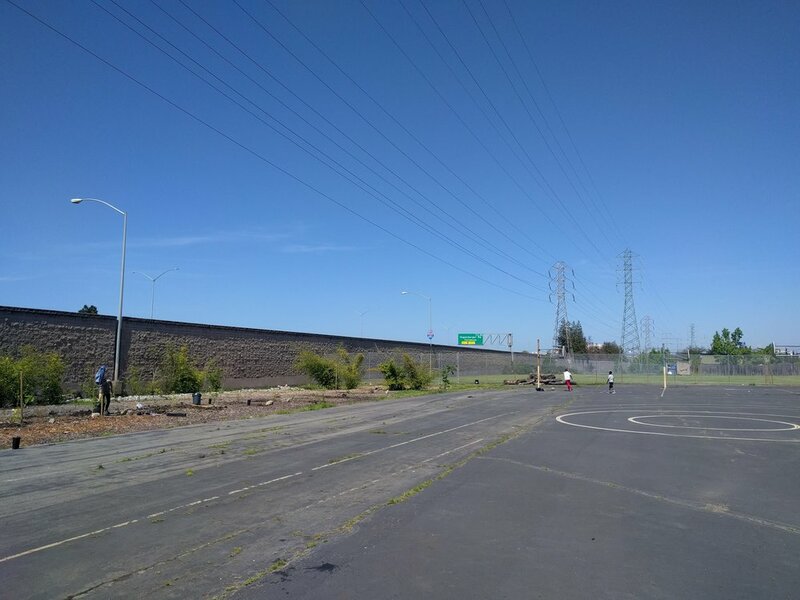 Off we went to plant some trees in the thirty foot wide space beneath PG&E's high power lines, between the school’s expansive asphalt play area and the twenty foot tall sound dampening wall that separated the school from I-880. Straight into their tombs of the hardest, least permeable, blackest clay I have ever seen. When you drove your shovel into the ground and lifted it out you might think you had excavated a piece of an old tire. And no sooner had you dug a pit deep enough for the little fig tree then you encountered groundwater, no more than 18" down! All the same, it's quite an amazing little landscape that's been made over just the last year or so. 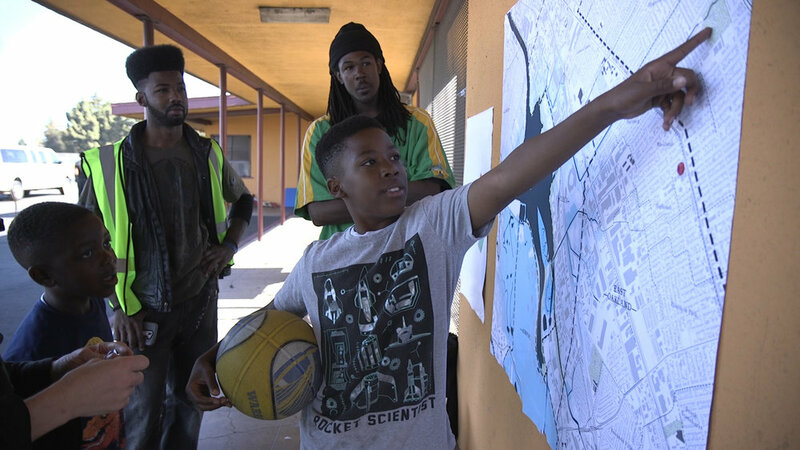 It's all due to the vision of Coach Archie of Higher Ground, who is a former and long-time member of the Conservation Corp and Alameda Flood Control District. 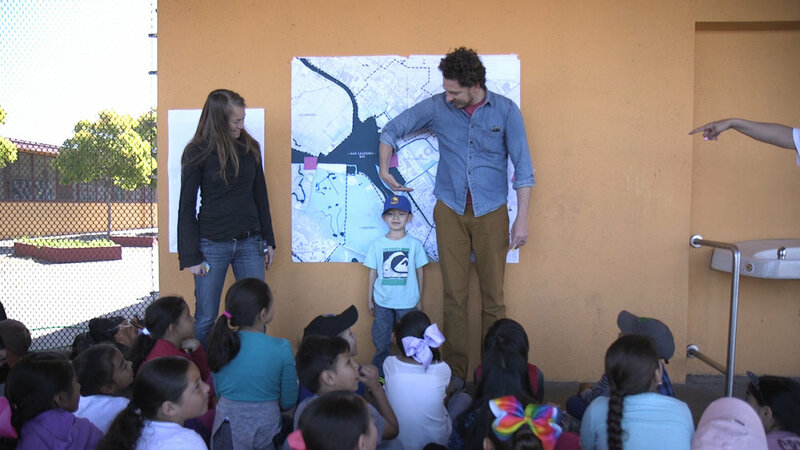 He told us of decades of work on watersheds throughout the East Bay, and the coming challenges that Deep East Oakland will face with flooding and sea level rise, which he knew through hands on and deep on the ground experience and observation. Even this little strip of land against the highway, he noted, flooded with two feet of water last year during the spring rains. He is a wealth of hard earned wisdom and hands in the ground knowledge about flooding, channelization, and ecological restoration; and offered us at some length his take on some “black and brown solutions” for the problems of hardened urban landscapes that have no room for water. A valuable contact, an important resource, and “get it done” person to engage with and ensure has the resources to solve problems in an immediate and practical way. He invited us to "walk around and take a look" as the best way to get started with the work. And so we did. I felt like we had found a little microcosm of the issues we are grappling with in one place. A public elementary school with 2 acres of asphalt play area that causes flooding against the wall of the interstate where community organizations are trying to create a little bit of green space in compacted clay left over from the alluvial plain that it once was. All in sight of the coliseum, with high power transmission lines overhead to boot. As we were wrapping up our work and collecting the shovels and now empty nursery containers we ran into Marquita "Keta" Price, of the East Oakland Collective, who was touring projects and Earth Day events with her fellow classmates enrolled in the Intro to Environmental Sustainability course at Merritt College. She is a powerhouse of action, ideas, and visions. As the Urban and Regional Planning Officer for the East Oakland Collective, she has brought a clear, consistent, and compelling call to the All Bay Collective to always be centering and foregrounding the communities of East Oakland and respect their voice and self-determination in the place that they live. The mornings work complete and the kids picked up by their parents, we headed off to go check out Planting Justice, which was just the neighborhood south of Brookfield. By the map you would think you should just be able to bike over in a couple of leisurely minutes. But no, fences and disconnected streets abound. We made our way through the industrial neighborhood with no bike infrastructure to speak of. At the end our trek, we were inspired by the incredible work at Planting Justice's nursery. We had a lovely lunch break, and joined in the Earth Day work, transplanting grafted almond trees into pots ready for shipment. Gavin Raders one of the founders of Planting Justice, showed us the way and we got to work. Planting Justice is celebrating its 10th year anniversary this year, but the nursery is only 2 years old. Doesn't look like it, has the lived in and well worked character of an endeavor that's been in operation for a decade. Good prices too! They ship all over the country, and run a landscape contracting operation. "Wild strawberries in the creeks natives use to eat them. Now the flood district uses round up to DE vegetate the channels. I asked them if they were worried about the Roundup getting into the bay and harming the wildlife. He said, 'No that's not a problem. It’s Roundup Ready, It's ready for the wildlife!'" As I was peering over the fence to get a better look at the conditions of the drainage channel, I spotted Keta and her fellow students again, walking along the section of San Leandro Creek that has been the focus of a planning and grant effort to construct a bike and pedestrian path along the creek that would connect the communities of Sobrante Park, Columbia Gardens, and Brookfield Village to Martin Luther King Jr. Regional Shoreline that partially rings San Leandro Bay. The effort has been shepherded and supported through years of work by Robin Freeman of the Merritt College Brower Dellums Institute for Sustainable Policy Studies who I had spoken with during lunch at Planting Justice. I asked Keta later what it would take to get this incredible and important project started. "We have a grant to do it. Yet the authorities are reluctant to move forward because none of the local or regional agencies want to take responsibility for maintenance. So rather than provide our neighborhood the better life quality we deserve by bridging access to the regional parks and trails they rather us continue to struggle environmentally and then criminalize our youth when they find negative alternates to do. The neighborhood high school students and local community college students can be trained on how to maintain. Security wise we can expand our local CRC taskforce and put a unit on the trail. Community are seen as liabilities and ignorant. We willing to take the responsibility no one wants... because its our lives and health at stake." On my way back, my bike caught a flat and I ended up walking about a mile under the BART tracks along San Leandro St from 98th Ave to the BART station. It is an almost obscene waste of space, an oversized street with cars racing down it, ruderal vegetation below the tracks, large ponds of exposed groundwater adjacent to the unused UP tracks. Between 85th and Hegenberger, where there is a bicycle path, bordered on either side with fencing, there is a quarter mile long encampment of dozens of folks who have taken up residence. I watched a family with an 8 year old girl run across the San Leandro Street in the midst of an endless block back to their home in a tent in the shade of the BART tracks. The urgency is very real, and there are many people we have met and are working with who are already there; working incredibly hard to address the decades of injustice, the pressing housing crisis of today, and thinking about the coming disasters of the future.